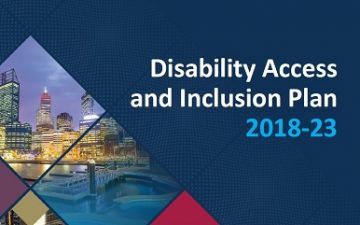 The Insurance Commission of Western Australia is committed to increasing awareness of access and inclusion issues, and improving our services to the community. Our Disability Access and Inclusion Plan 2018-23 provides the framework and practical strategies to improve access and inclusion for people with disability who engage with our organisation and its services. The Plan has a focus on enhancing our service delivery to people with disability – better customer service is a recommendation of the State Government’s Service Priority Review. To help us deliver this, we refreshed our corporate culture in 2018 by placing greater focus on our customers’ needs and stakeholder engagement. The strategies outlined in the Plan complement our core function of managing insurance claims from people injured in motor vehicle crashes and at work. People injured in these circumstances often require support for access and inclusion, so the Plan details initiatives that assist that cohort engage with the organisation, as well as other stakeholders. The Insurance Commission welcomes feedback on the Plan and experiences of the accessibility of our facilities, services and information. To provide feedback, please email daip@icwa.wa.gov.au or contact the Employee Development Manager on (08) 9264 3491 (Mon-Fri, 9am-5pm). A number of disabled parking bays are available in the car park located underneath the Forrest Centre. The car park entrance can be accessed from Mounts Bay Road. Australian Standard accessible toilet facilities are available on the ground floor, and also on the 13th floor, near our reception area.